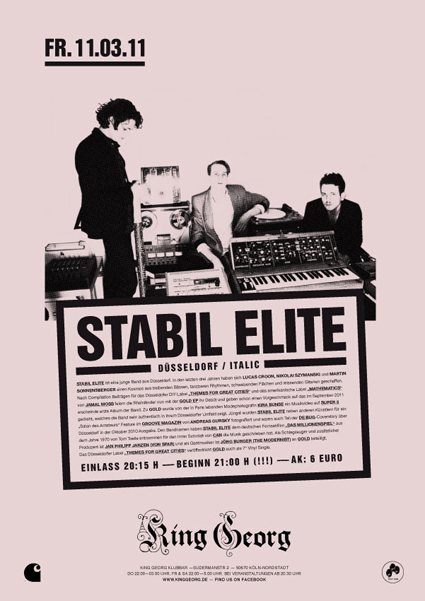 With the analog power of antique synthesizers, multiple layered guitars, minimal drum pressure, and some mantra like Pop singing the young trio from Düsseldorf reanimates the mystical power of New Wave in a thrilling contemporary way. With an anti-corporate attitude and an experimental sound aesthetic they bring the Ziggy Stardust feeling back on stage while pushing their audience with moving Krautrock shuffle rhythms. You have some asymmetric 80s New Wave styles in your wardrobe? Well – throw them over, come by, and dance with tears in your eyes.